Not too long ago, most people on Earth could look up at night and see the Milky Way's stunning ribbon of stars. But if you live in a modern city or suburb awash in light pollution, that dazzling view of the night sky is about as rare as a wild predator sighting. The Orion Nebula as seen through a DSLR and 600 mm zoom lens. All night images combine multiple exposures of the sky to pinpoint stars, and the non-panoramas also use multiple exposures of the foreground to get the foreground well exposed and in focus. Our eyes cannot see the sky like this due to the limitations of human vision, but a camera has no such limitation and with a long exposure (anywhere from 10 - 30 seconds) and high ISO [a measure of the sensitivity of the camera to available light] the camera can see much more detail in the night sky than the human eye. Because of the rotation of the Earth, the stars appear to move through the sky, so the exposure for the stars has to be short enough to avoid long star trails. I often take 10 exposures at ISO 5000 or 6400 for 5 or 10 seconds each and stack, align, and average them to get pinpoint stars and a lower signal to noise ratio. All of the photos shown here were taken by Woodworth, using a Nikon D800E digital SLR camera. The Milky Way as seen from a sea cave in Maine. 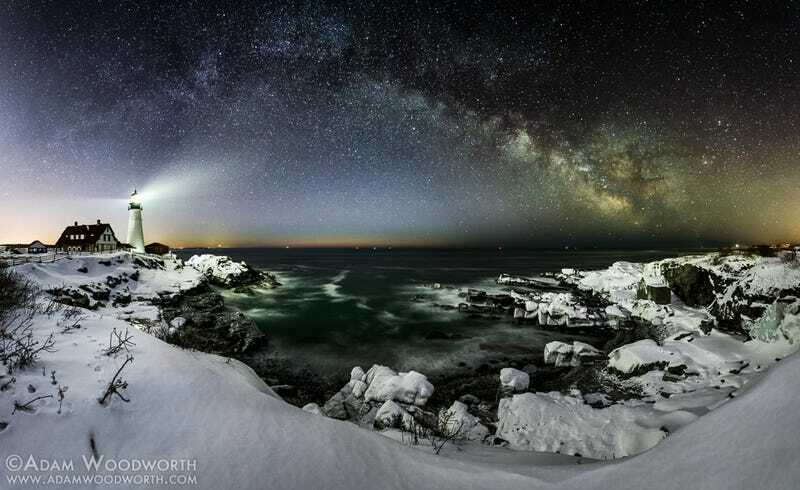 180 degree Panorama of the Milky Way over the Rockland Breakwater in Maine. The Milky Way over Newport Cove and Great Head in Acadia National Park, Maine. You can check out more of Woodworth's work on his website. And if you're more than casually interested in astrophotography, Woodworth has recently released a video tutorial outlining the process that goes into creating his spectacular starscapes. Personally, I just like to be reminded every now and then that our modern, electrified world pales in comparison to the brilliance of the stars. All photos courtesy of Adam Woodworth.